Now, grow your resume writing practice by attracting elite, executive job seekers with CDI’s executive resume designation! #1 – They understand their worth and will invest in themselves. #2 – Their career history is filled with juicy challenges, actions, and results making it easy to create a powerful resume. #3 – They are frequently articulate and able to communicate their value, brand, expertise, and accomplishments. No dragging it out of these folks! #4 – They have a powerful referral network to send more prospects your way. But if EVERYBODY wants to work with executives, just how do you stand out from the crowd? With CDI’s Certified Executive Resume Master (CERM)!! When you earn the CERM you become one of less than 25 individuals worldwide (there are currently 18 to-date) who have become designated as a Certified Executive Resume Master! 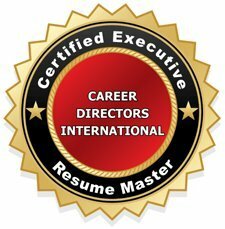 Since executives love to feel exclusive and be catered to, this high-level credential from CDI, a well-recognized industry leader in resume certification, can put you head and shoulders above the rest, making it even easier for you to attract new business from the executive marketplace. As a savvy executive writer, you need to be at the top of your game—and you can prove your impeccable credentials by gaining CDI’s seal of approval—The Certified Executive Resume Master credential. The Certified Executive Resume Master credential assures global executives at all levels that they’re in good hands as you leverage the tools of the trade you’ve acquired over the course of your career. Secure CDI’s seal of approval now: The Certified Executive Resume Master is your gateway to the lucrative executive market. To apply and qualify for the CERM, you must possess a recognized resume certification (e.g., CMRW, CARW, MRW, NCRW, CPRW, CMRS, CRS, MCRS, ACRW). It is also anticipated that applicants will have written for the executive market for some time, and will have a body of work that demonstrates mastery of contemporary executive representation such as personal branding, positioning, strategizing, and high-level formatting. Pay the credential registration fee (register below). Instructions will then be sent to you on preparing your submission via email. The CERM is a two-part credential that includes a portfolio of your work plus a short, 10-question Competency Review that encompasses general knowledge of the executive market, plus a short sampling of your writing ‘on the fly’. Submit four (4) examples of real-life executive resumes from your professional portfolio. Click link in email that is sent to you to begin CDI Executive Competency Review. The review does not require any study materials as questions cover general knowledge that any writer of executive resumes would be expected to know. On-the-fly writing requires proof of your ability to edit and construct sentences or bullet points that are concise, results focused, and indicate understanding of the questions posed. A period of four weeks will allow the certification committee to perform a blind review of the portfolio and assess the Competency Review. Should more than one additional submission (recognized as a second portfolio) be required to fulfill the needs of the CERM credentialing process, an added processing fee of $95 will be applied. Upon committee approval you will be conferred and awarded the CERM designation, which will include use of the logo for print and web, and print certificate. The CERM process allow you to take as long as you need within one calendar year of registration. However, it should take a very short amount of time to gather together the required elements as it is primarily an administrative record-keeping process of selecting resumes. The evaluation can be completed in one day. Please be advised that you must maintain an active CDI membership to complete any phase of the certification. Ready to start elevating your profile and stamping your mark of excellence across the executive world? Then let’s get moving! Register today to secure CDI’s newest seal of approval to become one of the first Certified Executive Resume Masters in the world! In the PDF for download you will see executive resume samples that are indicative of the type of writing expertise that would be expected of a successful candidate for the Certified Expert Resume Master credential. All requirements of CERM certification, renewal, and CDI membership standards must be maintained in order to earn or retain a CDI credential. CDI reserves the right to revoke a CERM credential for any of the following: Renewal requirements are not maintained and completed within required timelines. Membership lapses due to non-renewal. Individual is found guilty in a court of law for a grievance within the industry (unprofessional, unethical, unlawful conduct and/or business practices). For more information on the CERM credential, contact CDI at info@nullcareerdirectors.com. *CDI membership is a prerequisite for registration. For more information on membership visit the Join page.